To change the colors of your microstore navigation, go to Settings > Microstores. Once in the Microstores section, click on Microstore list. Next, click on the edit icon for the miscrostore you wish to modify. 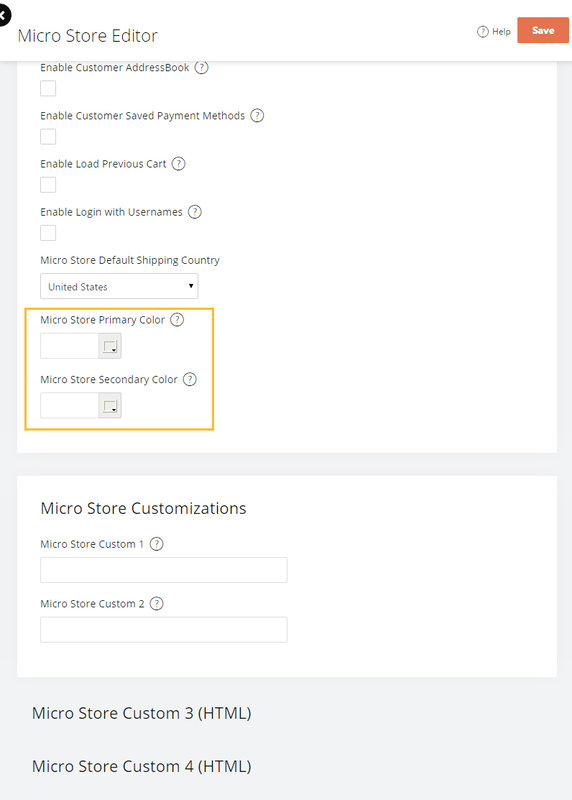 Once inside the micro store editor, scroll down to the “micro store settings” section. At the bottom of that section, you will see options to set the microstores' primary and secondary colors. Using these options, you can either enter in your color values or click on the color picker button to choose your color from the selector. Once you have selected the primary and secondary colors, make sure and hit the save button. Because of the way microstores render the style sheet, merge codes need to be added to the head tags in order for the colors chosen to display properly. To do this, click on the themes icon on the left hand column. Once in the Themes Dashboard, you can either click on the edit button, or the image of your active theme. The final step is to add the merge codes for your microstore colors to the header CSS. Below is an example of how to change the navigation, links, and hover links. Once you have added your merge codes, make sure and hit the save button. How do handle when the ##MSColor1## is null?